Rev. Billy Graham has made his support for and endorsement of Mitt Romney official. 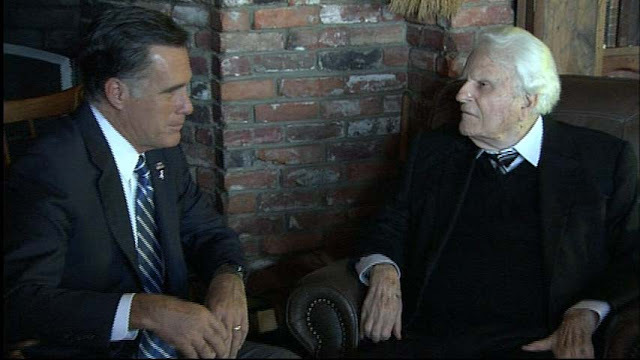 “It was an honor to meet and host Governor Romney in my home today, especially since I knew his late father former Michigan Governor George Romney, whom I considered a friend. I have followed Mitt Romney’s career in business, the Olympic Games, as governor of Massachusetts and, of course, as a candidate for president of the United States. “What impresses me even more than Governor Romney’s successful career are his values and strong moral convictions. I appreciate his faithful commitment to his impressive family, particularly his wife Ann of 43 years and his five married sons. Billy Graham is a wise and very much respected elder and man of God, but that doesn't mean that he is right endorsing Obama. I'm not saying Billy Graham is wrong either. All I'll say is that before you vote, pray (and fast as led by God) about which presidential candidate to vote for. I'll like to hear your thoughts about this endorsement. It is a pretty big deal.